Pearl, miniature from Cotton Nero A.x. The Dreamer stands on the other side of the stream from the Pearl-maiden. The poem known as Pearl came to us in the fourteenth century, c. 1370. It is the first of four poems copied by a single scribe. Patience and Purity retell stories from the Old Testament and Sir Gawain and the Green Knight is part of the Arthurian legend. 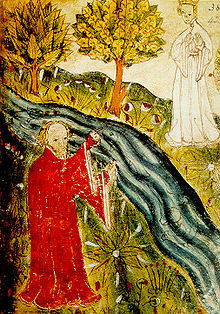 Paul Deane says, “We do not know who he is, but this author was one of the greatest English writers of the Middle Ages. But we know he exists only because of a single manuscript, containing four poems: Sir Gawain and the Green Knight, Pearl, Patience, and Purity. They appear to have been written by a single author; and of these, Sir Gawain and the Green Knight is considered to be one of the classics of English literature. The fact that the author did not sign his name to these pieces was not uncommon at the time. We must recall that English was the language of “commoners,” in a time when French was the language of the educated, the cultured, and the court. Only one copy of the text in which all four poems can be found exists. The British Library holds a a vellum manuscript of the poems. Even so, the poems ranks as some of the most important pieces of English literature. Wikipedia provides us a summary of the Structure and Plot of the poem. “The poem may be divided into three parts: an introduction, a dialog between the two main characters in which the Pearl instructs the narrator, and a description of the New Jerusalem with the narrator’s awakening. Sections I – IV (stanzas 1- 20) The narrator, distraught at the loss of his Pearl, falls asleep in an “erber grene” – a green garden – and begins to dream. In his dream he is transported to an other-worldy garden; the divine is thus set in opposition to the terrestrial, a persistent thematic concern within the poem. Wandering by the side of a beautiful stream, he becomes convinced paradise is on the other shore. As he looks for a crossing, he sees a young maid whom he identifies as his Pearl. She welcomes him. Sections V – VII (stanzas 21 – 35) When he asks whether she is the pearl he has lost, she tells him he has lost nothing, that his pearl is merely a rose which has naturally withered. He wants to cross to her side, but she says it is not so easy, that he must resign himself to the will and mercy of God. He asks about her state. She tells him that the Lamb has taken her as His queen. “Sections VIII – XI (stanzas 36 – 60) He wonders whether she has replaced Mary as Queen of Heaven. He also objects that she was too young to merit such a high position through her works. She responds that no one envies Mary’s position as Queen of courtesy, but that all are members of the body of Christ. Adopting a homiletic discourse, she recounts as proof the Parable of the Workers in the Vineyard. He objects to the idea that God rewards every man equally, regardless of his apparent due. She responds that God gives the same gift of Christ’s redemption to all. “Sections XII – XV (stanzas 61 – 81) She instructs him on several aspects of sin, repentance, grace and salvation. She describes the earthly and the heavenly Jerusalem, citing the Apostle John and focusing on Christ’s past sacrifice and present glory. She wears the Pearl of Great Price because she has been washed in the blood of the Lamb, and advises him to forsake all and buy this pearl. This entry was posted in Anglo-Normans, British history, Great Britain, literature and tagged " Pearl Poet, "Pearl, Chaucer, Dante, Divine Comedy, Piers Plowman, Sir Gawain and the Green Knight, William Langland. Bookmark the permalink.